Guild Wars 2 was 6 months from the beginning of closed Beta to launch. So I guess late Summer, early Fall. That is complete speculation though. No one knows, they only say the invites will be coming out in the coming weeks and/or months. Just keep checking in on TESO FB page, Twitter and Official Website. I'd give it a month, max, until beta keys are sent out. They always try to make it seem like the deadline is far away and then BOOM, beta signups happen. Maybe I'm missing something, but I've never really understood the apparent need in forums to close threads. Seems like it would be pretty self-moderating. If people are interested in a subject, it will stay near the top; if not, it falls off the first page and gets forgotten. Isn't that how it should be? I understand why Mods censor threads that are against the board rules, but why the push by board members to close threads, or worse, hostility toward threads they think are unnecessary or pointless? Isn't posting in that thread a self-defeating effort? Indifference is the worst insult, right? Like the rest of you, Im waiting anxiously for beta announcement also. Im testing Defiance right now and have tested many others in the years Ive been playing MMOs. They do tend to start 6-8 months before anticipated release. From the little hints Ive seen in posts and heard in podcasts, it sounds like they are planning a little more extended testing for TESO. Maybe this is just wishful thinking on my part though. Im extremely anxious to find out if/when I get into beta, but more importantly, Im hoping they take the time to do proper testing. A game of this scope is gonna require a lot of dedicated beta time. Theres nothing worse than a game that is still just loaded with bugs and issues at release. It sounds like they are approaching it the right way though. You guys haven't gotten beta keys yet? (February 4th 2013, 07:36 PM)Knightmare Wrote: You guys haven't gotten beta keys yet? Generally speaking, what you're saying is correct. Which is why I haven't closed this topic and I think it's fine as-is (people can speculate, no harm in that). I won't really close a topic unless it's bound to break rules or in some way depreciates the quality of posting around TESOF. Anyway, just thought I'd clear that up. On topic: Yep, what @Infamous said is what I'm going with, as that's directly from ZOS. When they say in the coming weeks, I'm hoping that means fairly soon! And no, nobody has yet received beta keys. (February 4th 2013, 07:55 PM)Tecca Wrote: And no, nobody has yet received beta keys. So I've found some pretty interesting information that you may already know but it is beta related so I thought I would post here. - Upon death, players may spawn where they died with a penalty, or respawn away from their corpse at a Wayshrine. 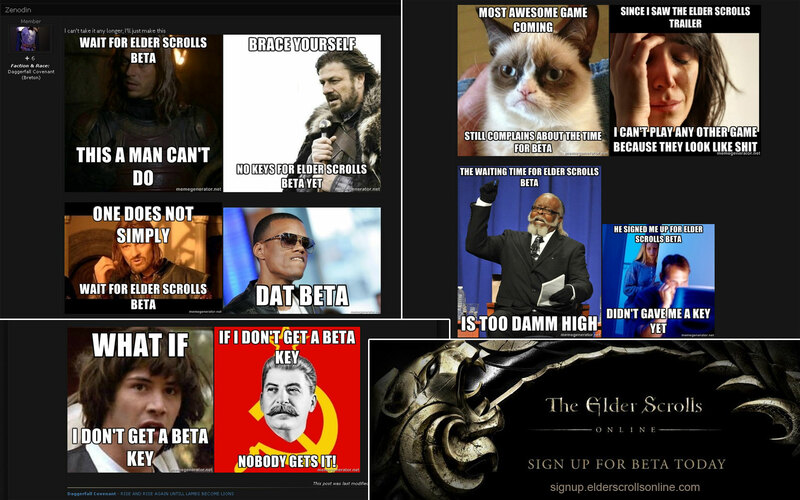 - The official release of TESO is "targeted" to be at the end of 2013. One of the beta interview links is right here. Bug Hunter? Exploit Killer? Fearless Pioneer? Join TSTG! Well if you watch the Beta Video they tell you " VERY SOON and Over the Next Few Months " There are ppl already doing beta now. NDA prevents them from saying they have beta or alpha access.